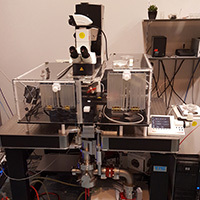 XM3 is a unique system (developed by the group of Dr. Krawczyk at our Core Facility) that allows (micro)irradiation of adherent cells using ultra-soft X-rays (0.1 - 6 keV) and confocal imaging of cellular responses, in real time. The system is composed of a custom-made ultra-soft X-ray source and an upright Leica SP5 confocal microscope. For irradiation, cells must be cultured in special dishes with ultra-thin bottom. Cells are irradiated from below and imaged from above, using a 63x, 0.8 NA dipping lens. Short as well as long-term time-lapse experiments are possible, using multiple colors. The system is equipped with one HyD detector and two PMTs. All standard excitation lines are available (405, 458, 476, 488, 496, 514, 561 and 633 nm), enabling multi-color imaging.